1. 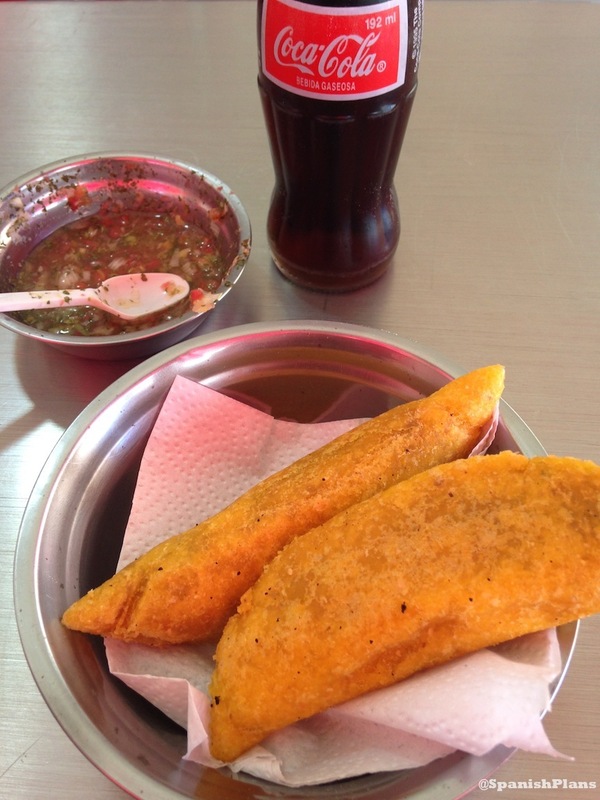 Empanadas: Typically filled with either chicken or beef, these are little pockets of deliciousness! Add various salsas and enjoy with a cold Coca-Cola in a glass bottle. 2. 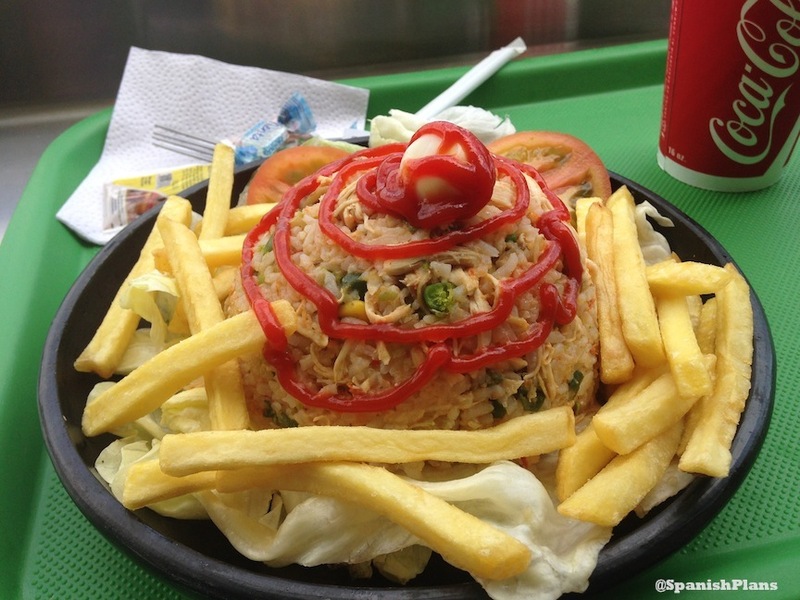 Almuerzos: “Lunch” or sometimes called “Menu ejecutivo”, this can cost between $2-3 in Colombia, Perú, or Ecuador. 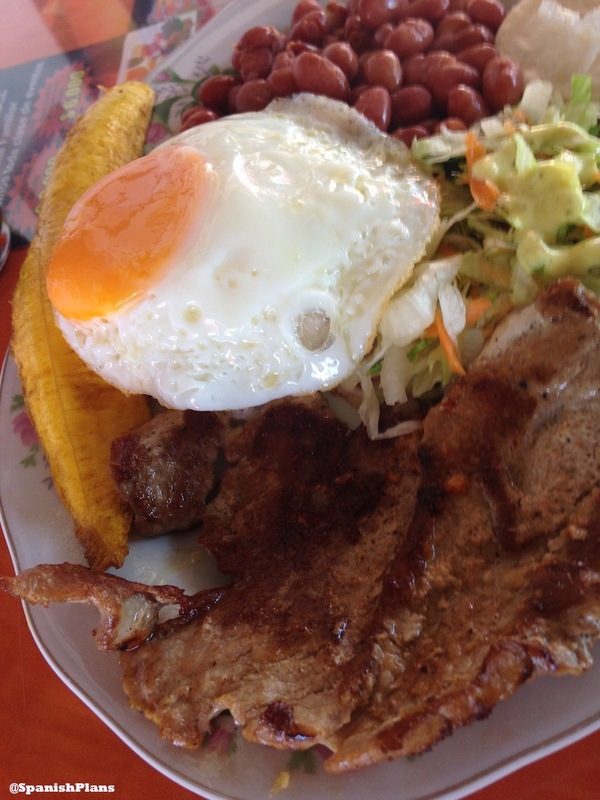 This particular “bandeja” plate from Colombia starts with the soup of the day, your choice of meat (in this picture, steak), salad, beans, rice, plantain, and in this case, fried egg. Fruit juice is also included in this price. 3. Frutas: My favorite part is the availability and cheapness of fresh fruit. 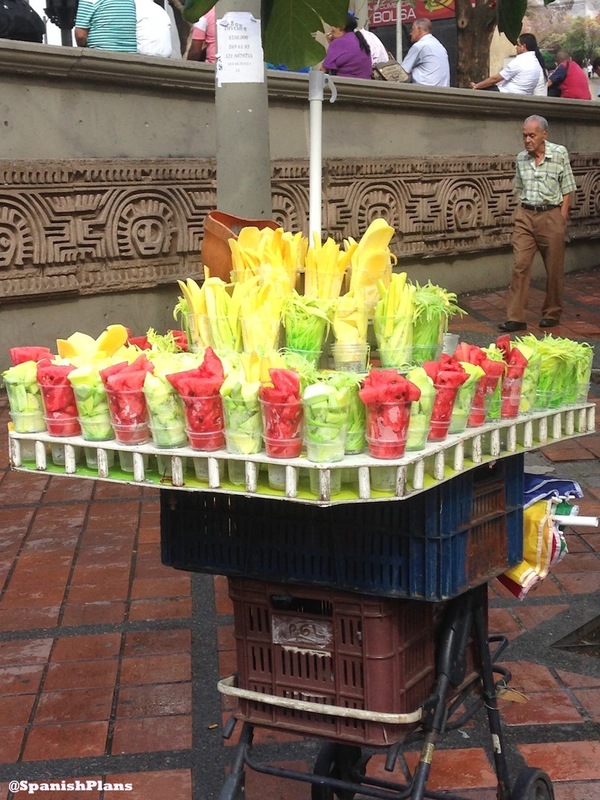 Most common fruit sold by street vendors is sliced mango. They’ll squeeze a lime over the mango and add salt. Such a tasty treat. At most this will cost you 50 cents – $1. You’ll likely see a cart outside schools at dismissal times as this makes a great snack on the students’ walk home. 4. 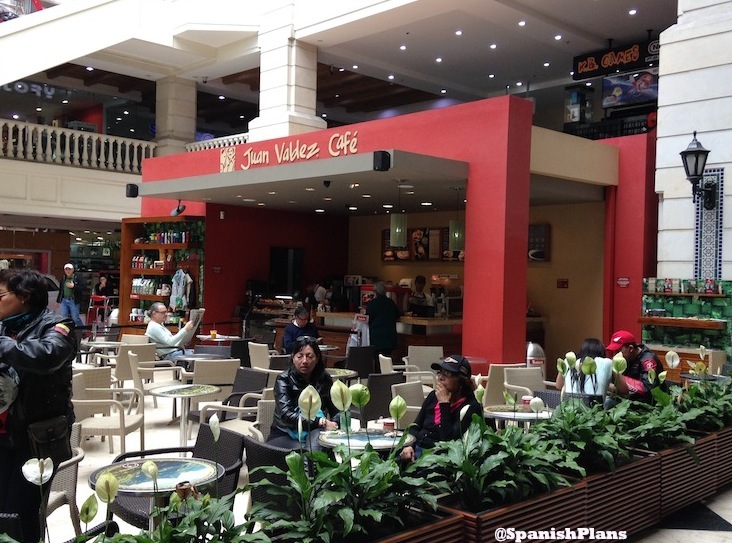 Café: Starbucks has nothing on Juan Valdez Café. 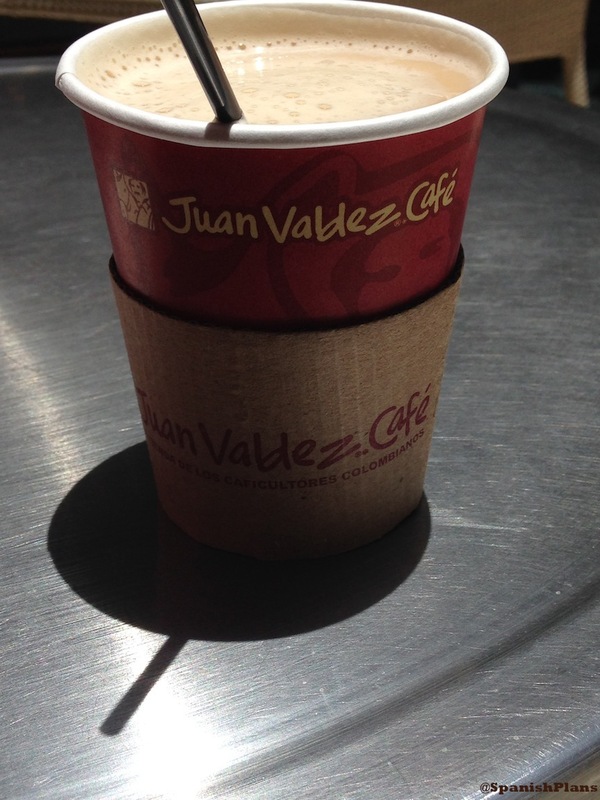 This Colombian coffee shop has the best granizado de café (frozen coffee). 5. 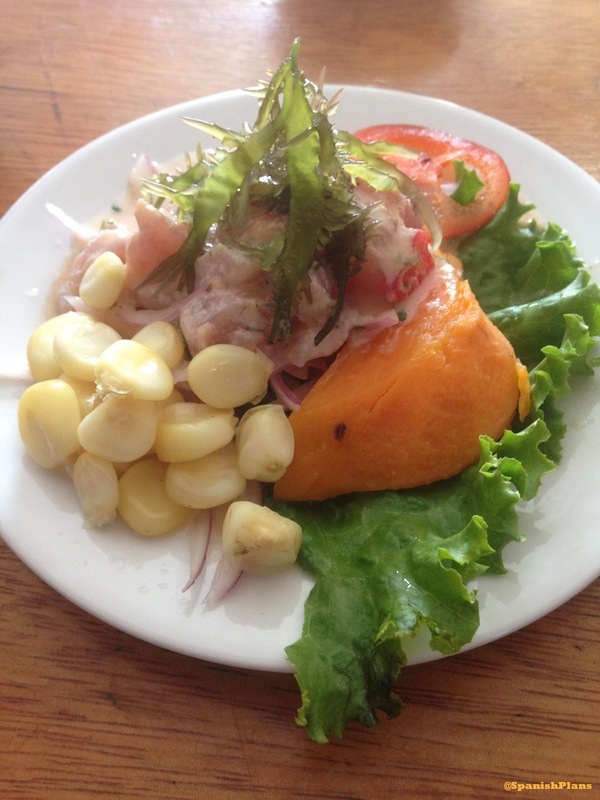 Ceviche: The Peruvian specialty. This plate of fresh fish comes with corn and sweet potato. Spiced with ají to give it a slight kick. 6. Jugos naturales: With the abudance of fresh fruits, the typical drink is fresh natural juice. 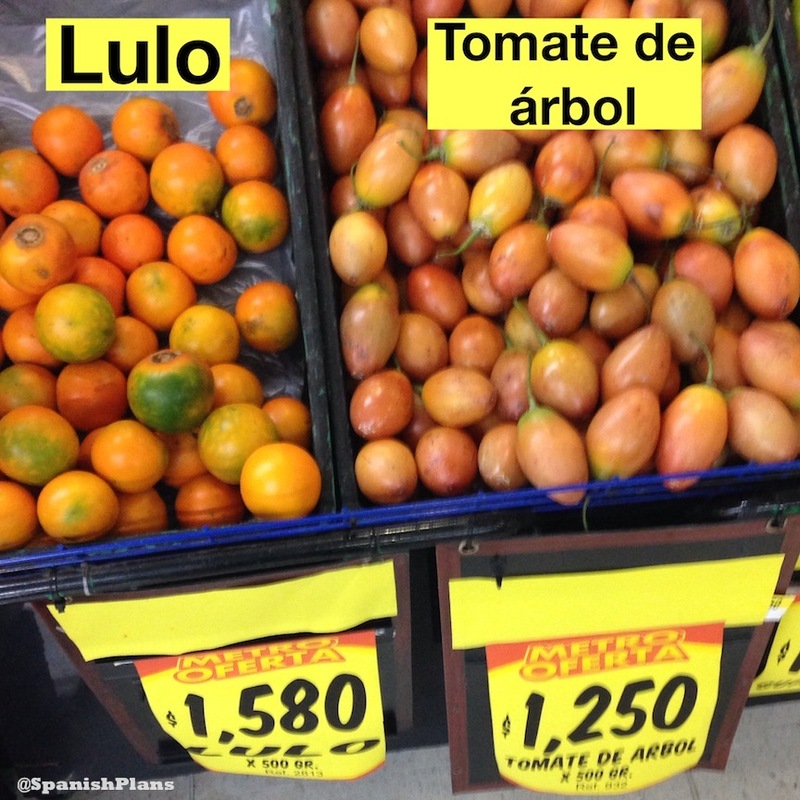 Two fruits you will find in Colombia are Lulo and Tomate de árbol, which make yummy drinks. 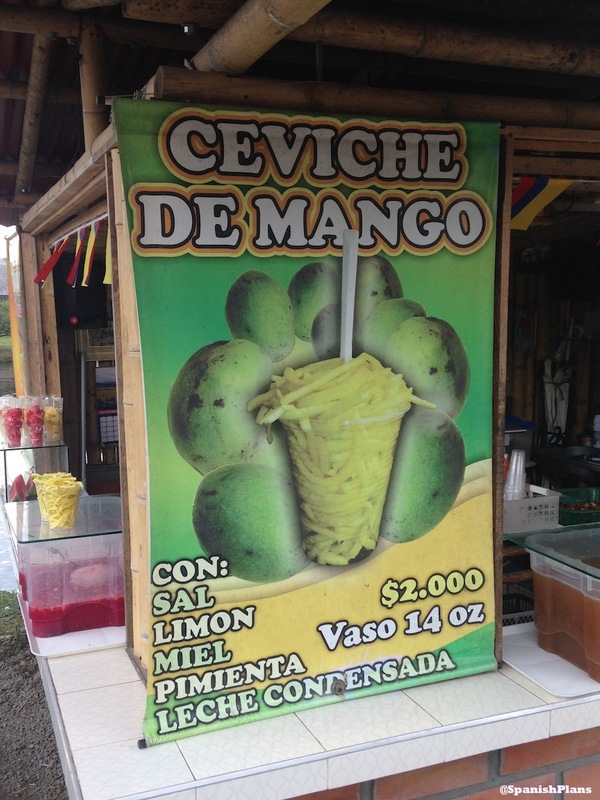 Other favorites include mango and maracuyá. 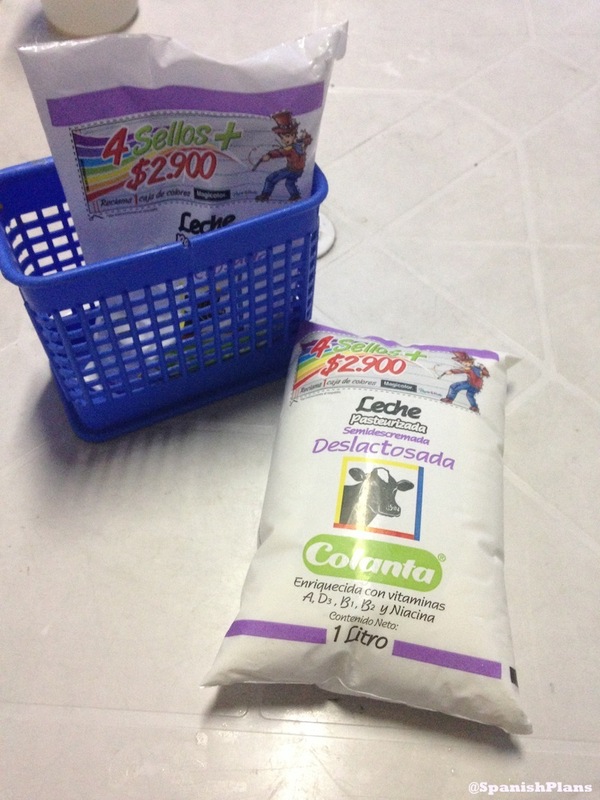 You can get these mixed with water or milk (en agua/en leche). 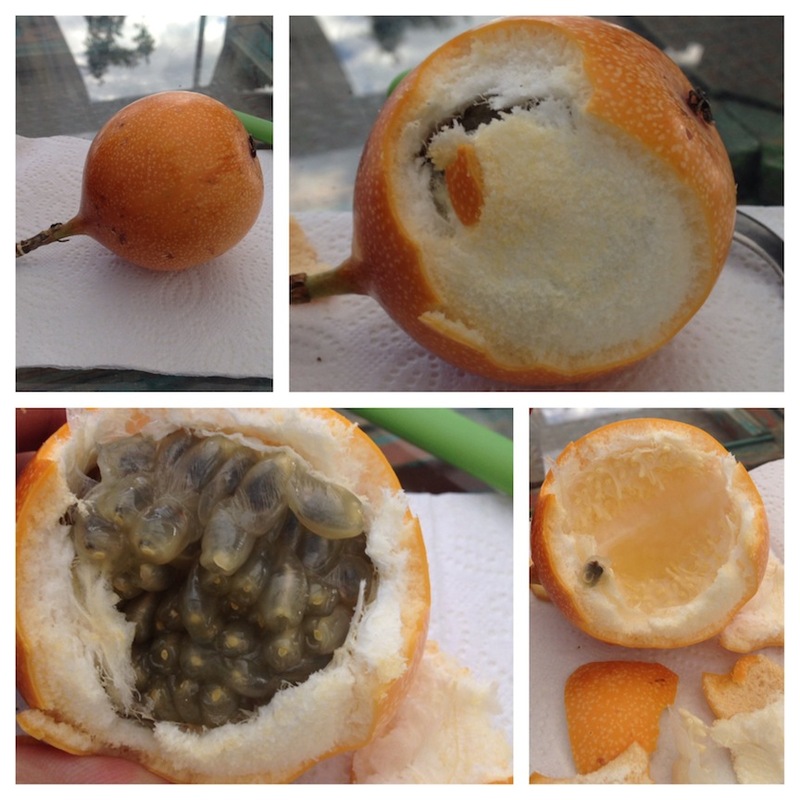 Or you can eat this granadilla (pictured right) fresh, as well. 7. 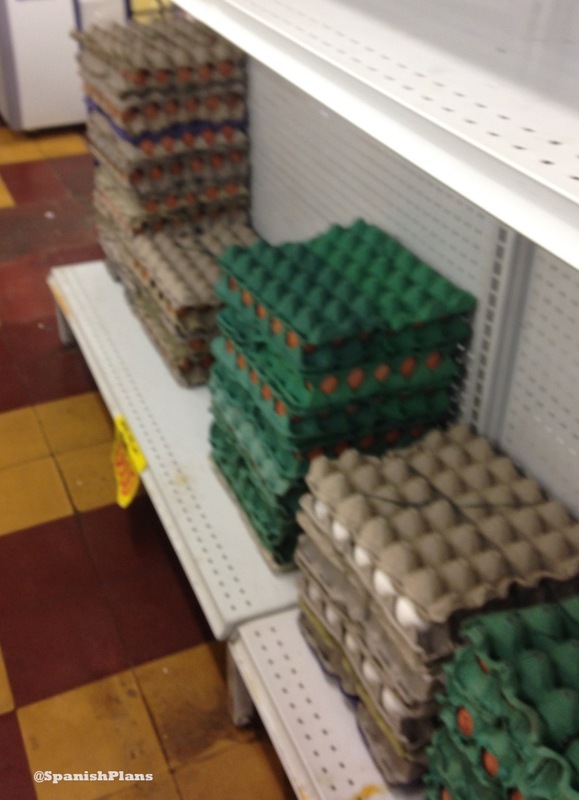 Huevos: One things Americans will find different when going into grocery stores or markets is seeing eggs on shelves. 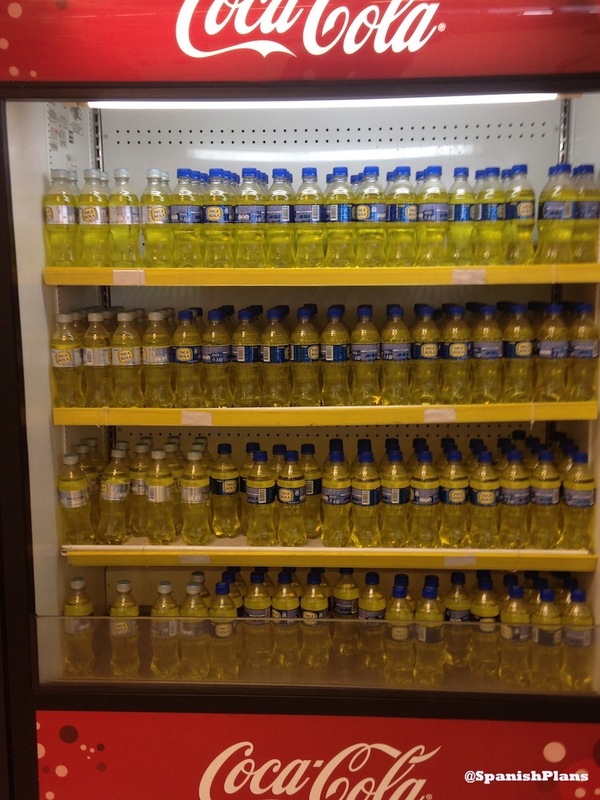 And no, I don’t mean refrigerated shelves. In fact, the refrigeration of eggs is mainly an American practice, so you won’t see that in most places around the world. 8. 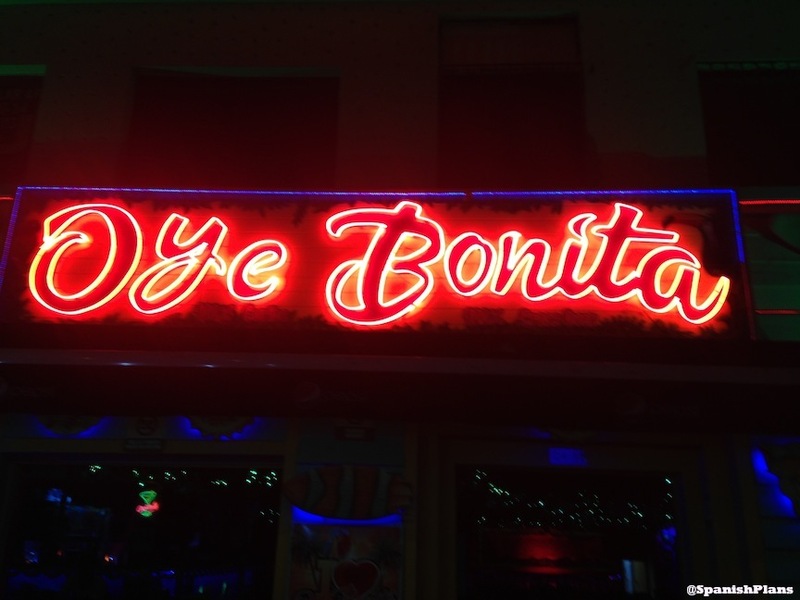 Bags of…. milk? : Another common practice is selling of beverages in bags. This practice extends to milk. Most milk is also not refrigerated either. Most homes use a plastic holder to pour their milk after it’s opened. 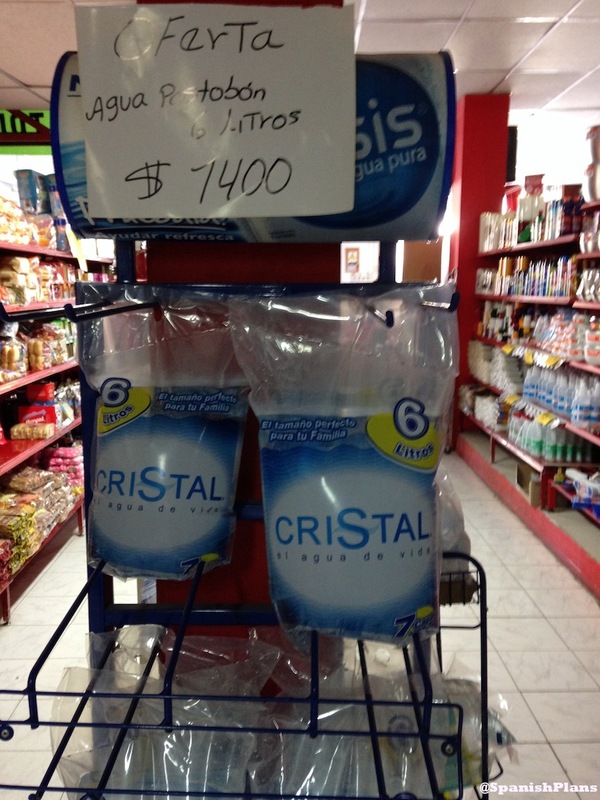 Instead of buying bottles of water, little bags of water are more common since they are cheaper. Although you’ll even see big bags of water as well, such as the 6 liter bag pictured below. 9. 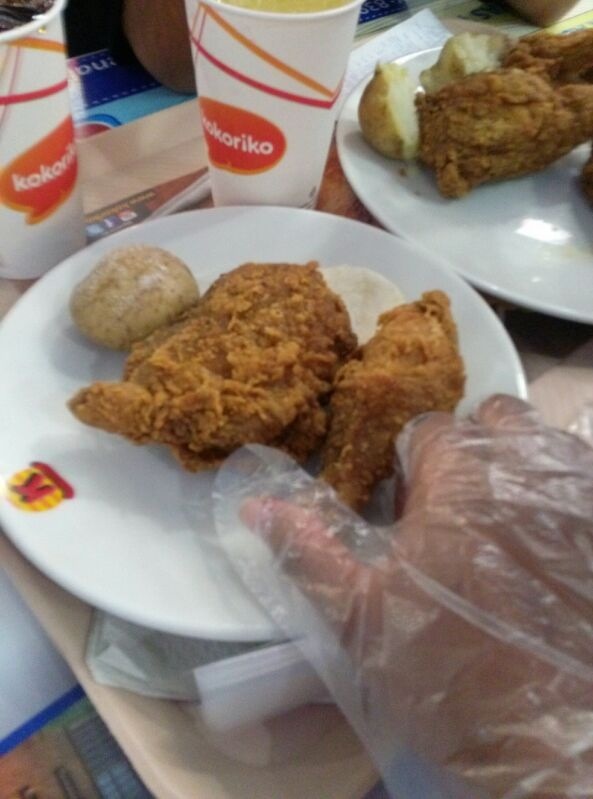 Pollo: Most “fast-food” restaurants are fried chicken places. 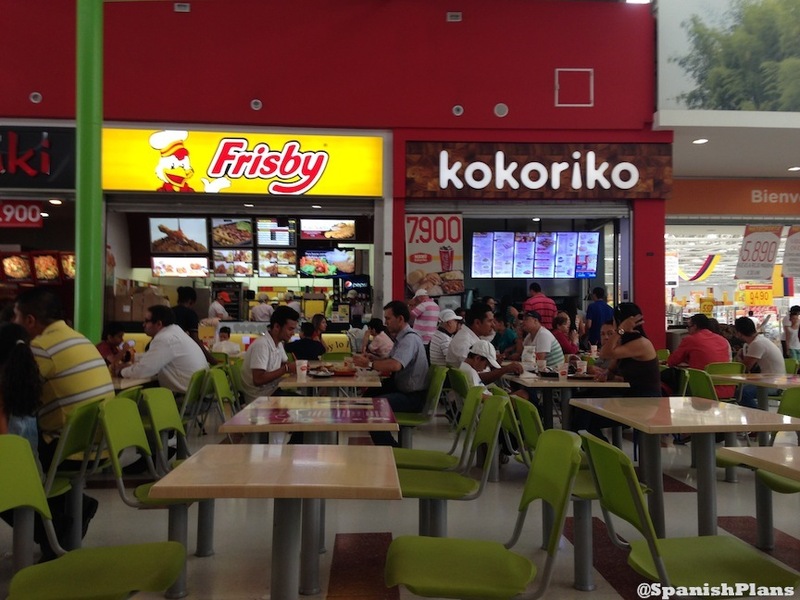 Two of the most popular chains in Colombia are Frisby and Kokoriko. With your meal, you’ll get a little envelope of plastic gloves to wear so your fingers don’t get greasy. Pretty smart! 10. 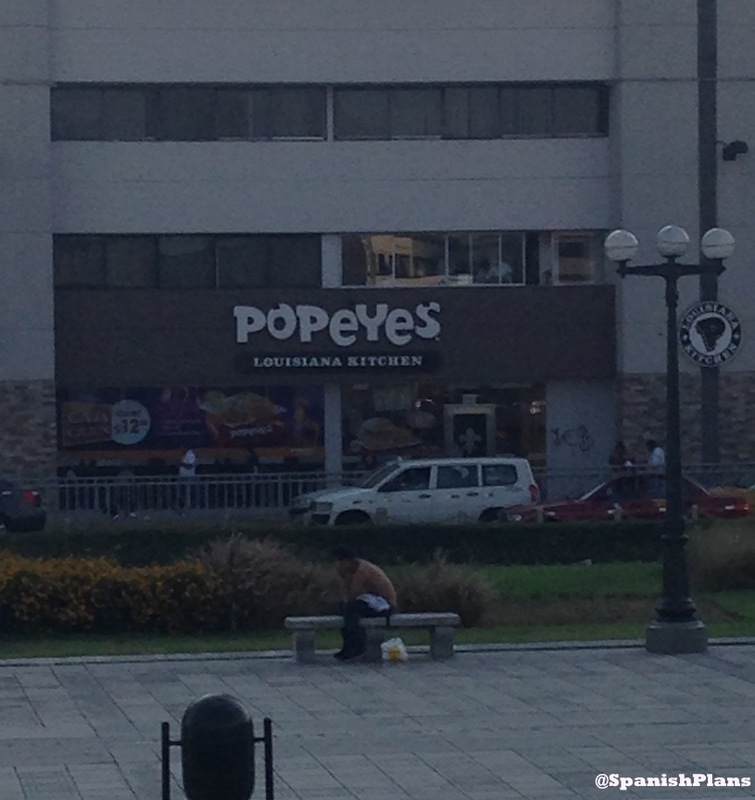 American Restaurants: While you’ll see plenty of KFC restaurants in Colombia and Ecuador, spotting a Popeyes Lousiana Chicken is a strange feeling when you are in Perú, considering that the gastronomy of Peru is a main attraction. And don’t even get me started on McDonalds! Subway is pretty common, as well. 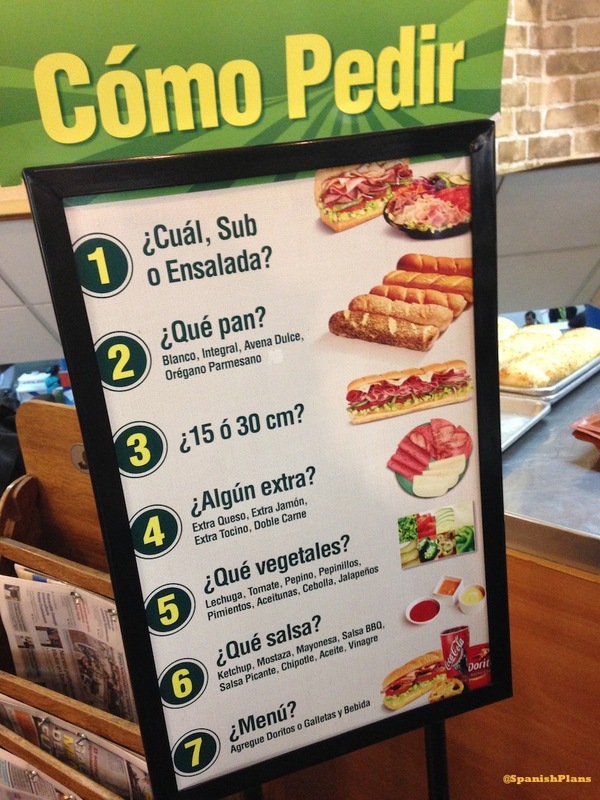 Can you order your sandwich en español? 12. Arroz con pollo: Rice with Chicken. And while we are looking at french fries, we should mention that a typical sauce for your fries is not only ketchup (salsa de tomate), but mayonnaise (mayo) or in some cases mixed together known as salsa rosada. 13. Soda, Gaseosa, Cola: No matter what each country calls it, the most popular brand worldwide is Coca-Cola, except in Peru, where locals prefer Inca Kola, the “golden kola”, with its sweet, bubblegum taste. Did you know Coca-Cola is different south of the US? That’s because it’s made with real sugar instead of artificial corn syrup. 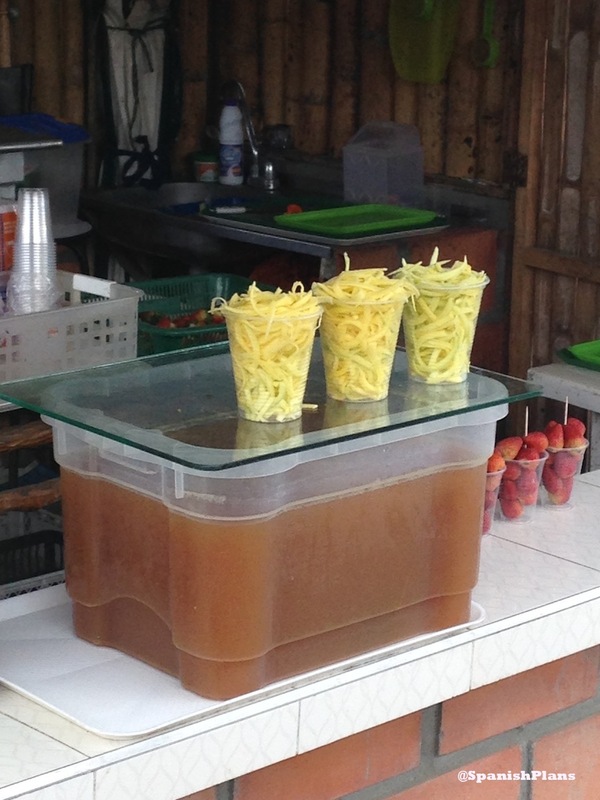 Most restaurants you go to will serve you a glass bottle, although plastic bottles are available at markets. Only big chains have soda fountains. 14. Papitas: Potato chips are a common snack. But their flavors are not so common, at least not for Americans. 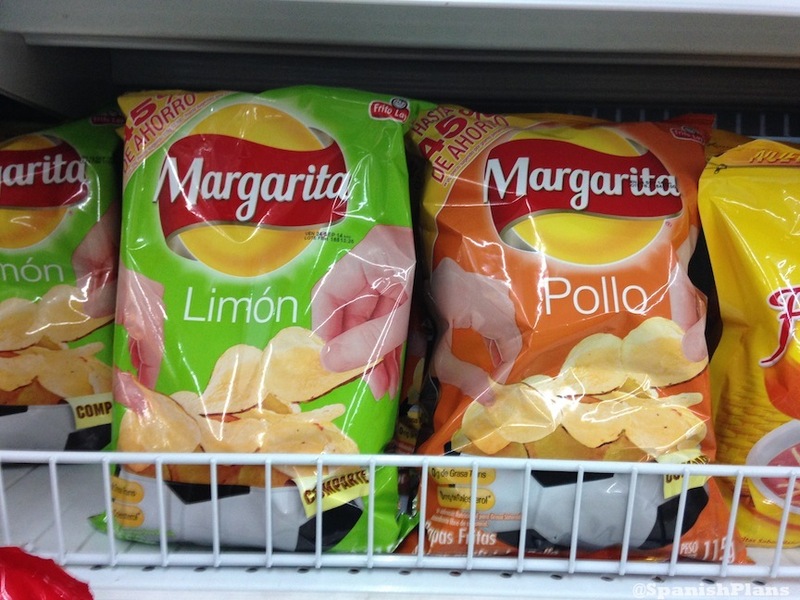 Pictured are pollo (chicken) and limón (lime) flavored chips, and you’ll likely see tomate flavored in addition to natural. 15. 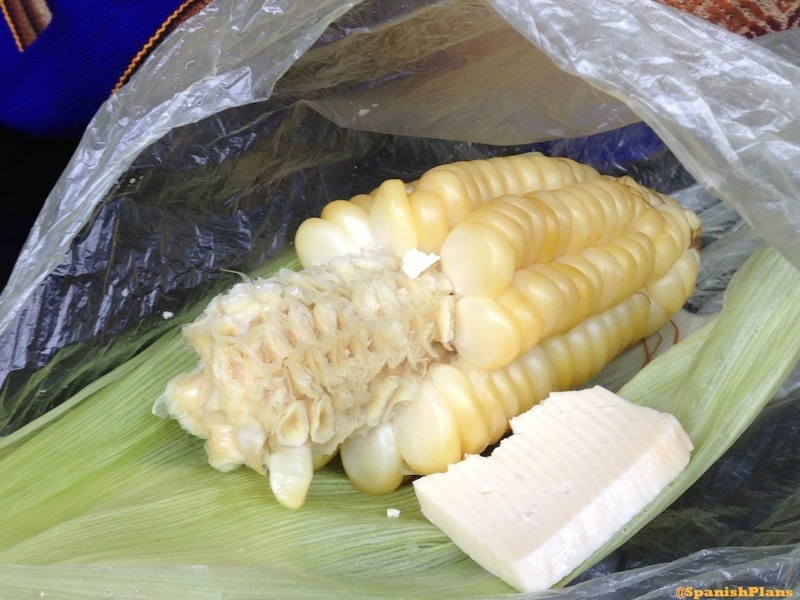 Choclo: In Ecuador and Peru, corn is known as choclo. 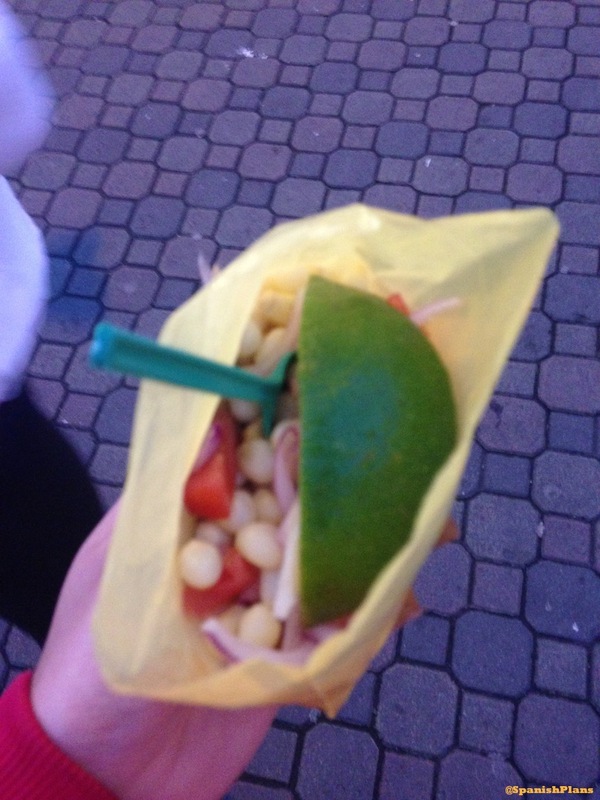 Street vendors sell a whole ear of corn with cheese, or you can buy it mixed with onions and lime and eat out of a bag. 16. 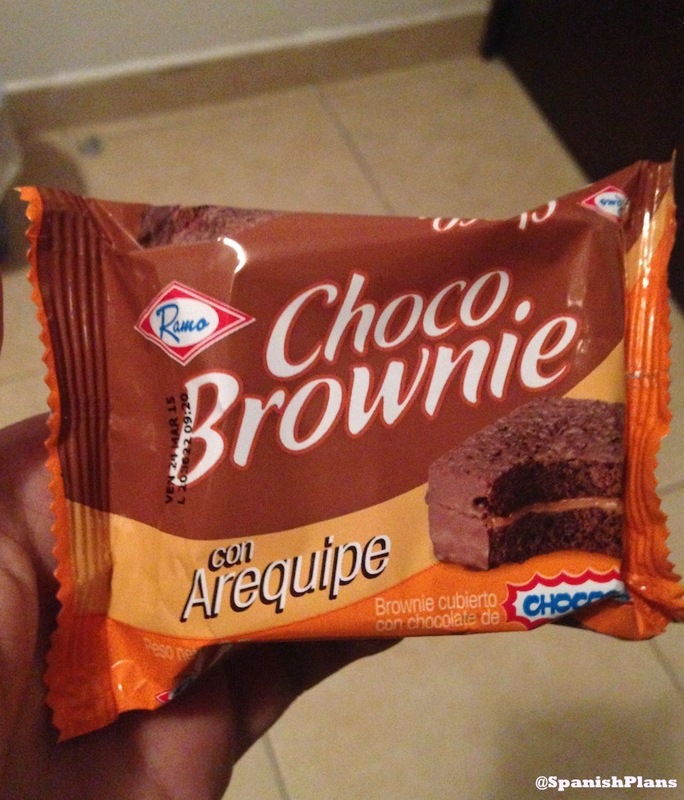 Arequipe: Also known as dulce de leche, this carmel-like flavor is in everything sweet: ice cream, coffee, brownies, and more! 17. 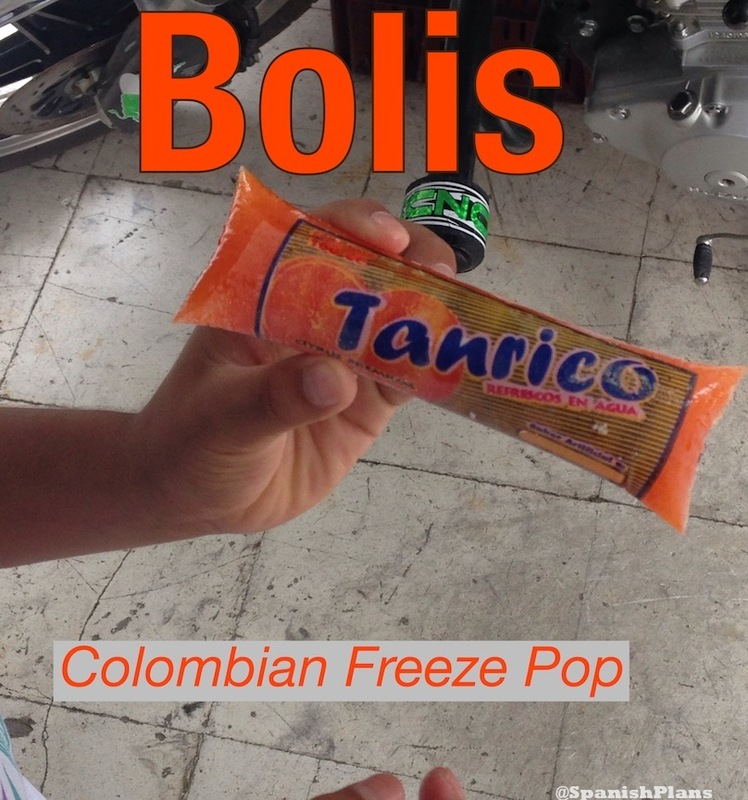 Bolis: Basically this is the Colombian equivilant of a freeze pop. 18. 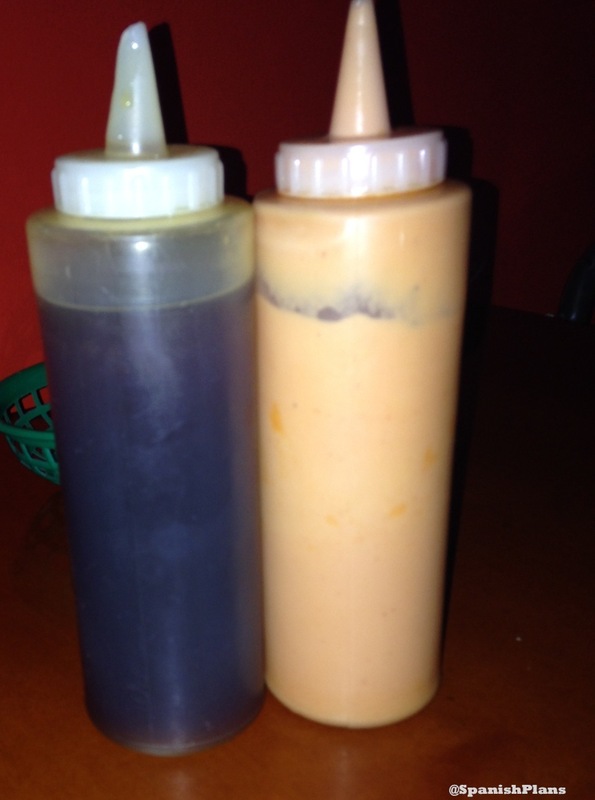 Pizza Toppings: One of the more interesting interactions was meeting with friends for pizza in Colombia and these two squeeze bottles were on the table. When my friend starting putting them on top of her pizza, I could tell it was honey and pink sauce (mayo + ketchup). As a Chicagoan and proud-pizza eater, I was taken aback. I decided to give it a go, and to tell you the truth, it was quite good. 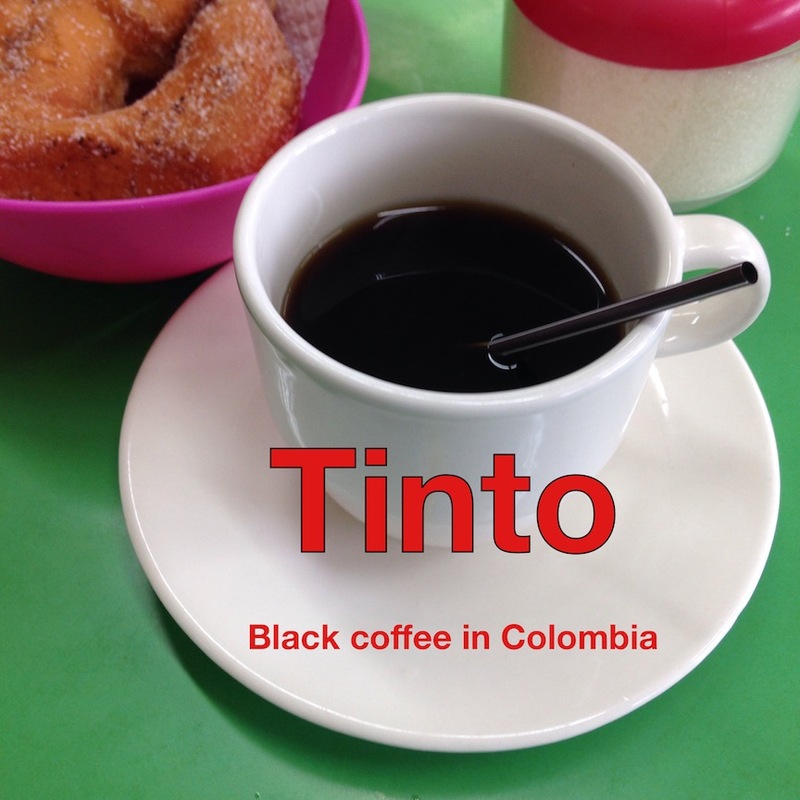 Note: This appears to be a regional phenom in the area of Risaralda, Colombia and is not done in other parts. 19. 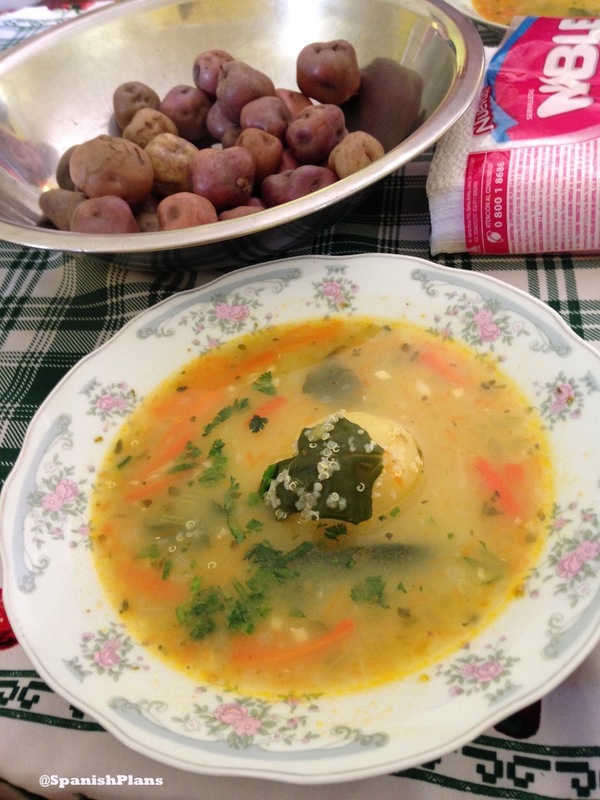 Quinoa: Besides having over 3,000 types of potatoes, Peru always grows plenty of quinoa, which makes for a delicious soup. 20. Local Restaurants: You’ll find some pretty interesting names for restaurants, including these two. 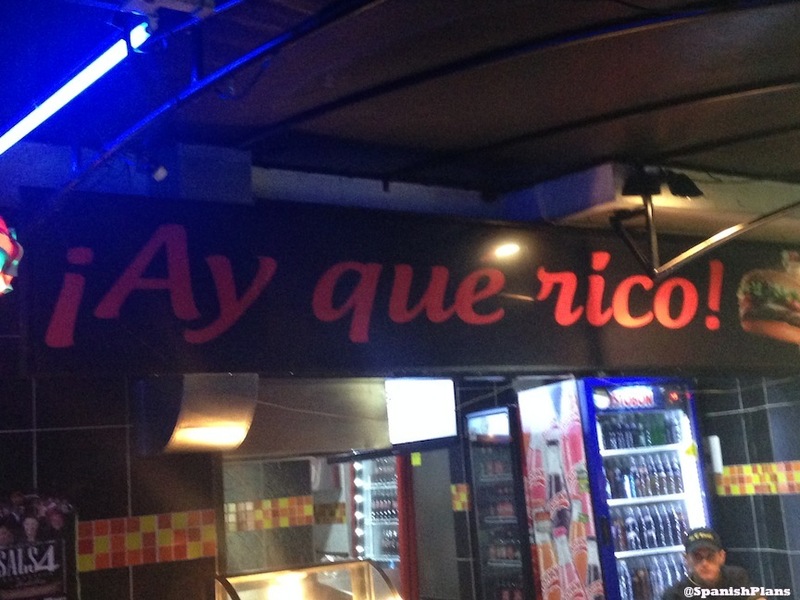 ¡Ay que rico!, or “So yummy!” and Oye Bonita, or “Hey, pretty lady”. 21. Street Carts: If it wasn’t obvious from any of the above items, street carts are definitely an option to grab some grub in the park. 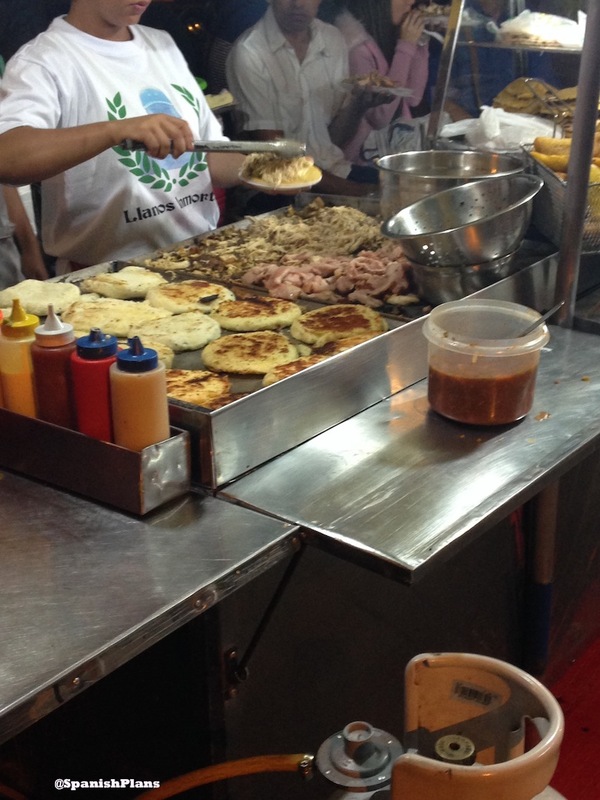 In Colombia, you’ll likely find arepas, chorizos, hot dogs, hamburgers, and more. Have you tried any of the foods above? 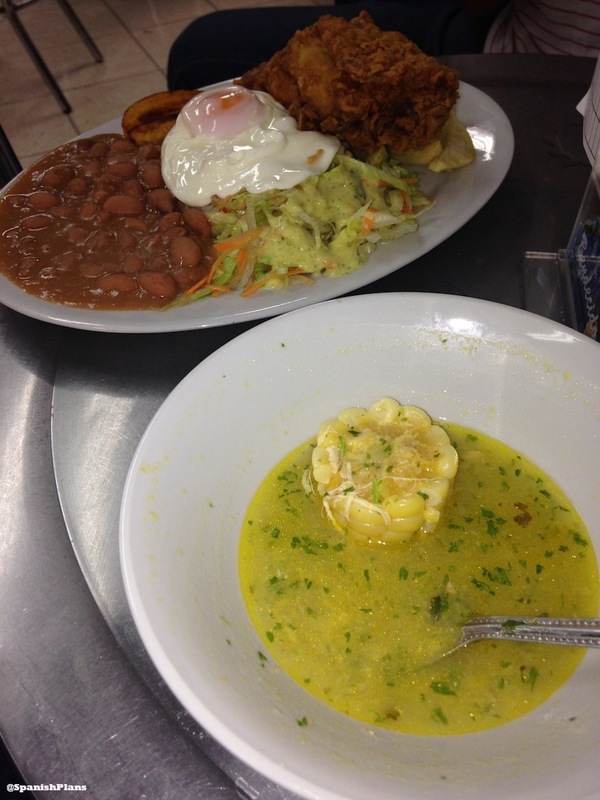 Have a story about a food you’ve tried on your travels? Tell us in the comments below! All Photos taken by @SpanishPlans. All rights reserved. you! 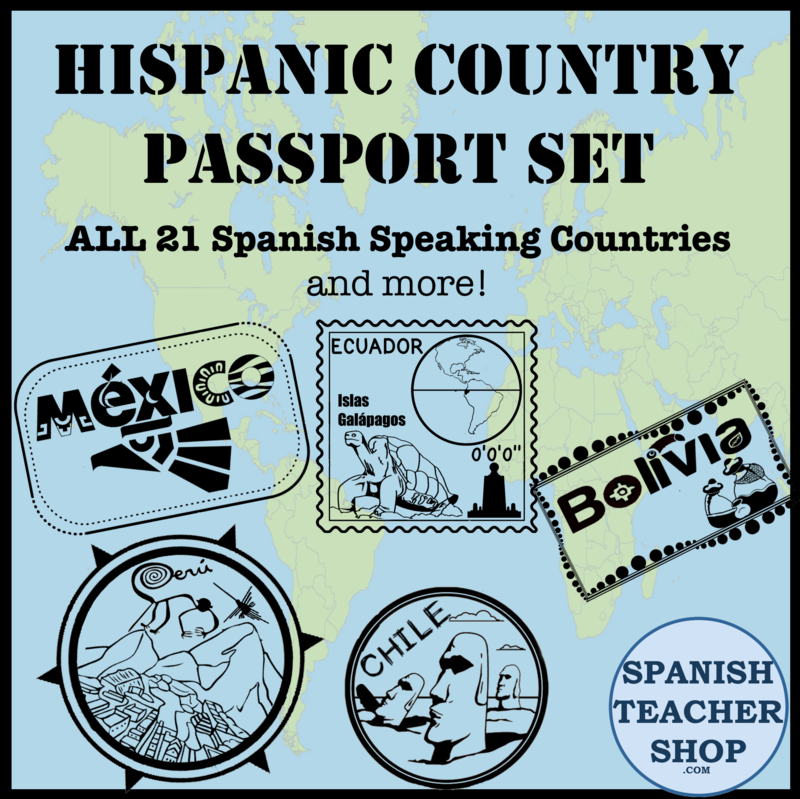 On your next travels, consider making a “culture box” containing typical things from the country.